If you’re looking for a way to infuse your fitness routine with some new energy and excitement and ramp your metabolism into gear, join Pamela Funk on Wednesday nights at 5:30 p.m. in the group exercise room for a fun-filled 55-minute Circuit Training class. Whether you’re a seasoned athlete or just getting started with physical activity, circuit training is a great way to challenge your body in a variety of ways while boosting the fun factor. 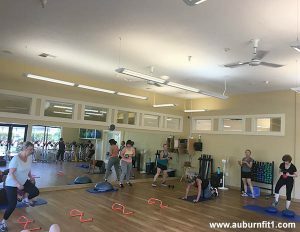 A typical circuit workout includes a variety of exercise stations. After completing a station, instead of resting, you move quickly to the next station. A muscular strength and endurance circuit alternates muscle groups, such as upper body, lower body and core, so little or no rest is needed in between stations. This type of circuit alternates sets of resistance exercise (body weight, free weights, dumbbells, kettlebells, bands, etc. ), with brief bouts of cardiovascular exercise lasting anywhere from 30 seconds to 1 minute.